U.S. consumer spending edged up a moderate 0.3% in August, the smallest gain in six months, as sales of cars and other durable goods fell. A key gauge of inflation slowed slightly after its biggest annual gain in six years. The rise in spending was the weakest since a 0.1% bump in February, the Commerce Department reported Sept. 28. Spending had been up 0.4% in both June and July. Consumer spending is closely watched because it accounts for two-thirds of economic activity. The government reported Sept. 28 that the overall economy, as measured by the gross domestic product, grew at an annual rate of 4.2% in the April-June quarter, the best in nearly four years. However, GDP is expected to slow in the current quarter to around 3.2%. An inflation gauge closely watched by the Federal Reserve edged up 0.1% in August, a tiny gain which left prices rising 2.2% over the past 12 months, down from a 2.3% 12-month rise in July which had been the fastest pace in six years. The inflation slowdown will be welcomed at the Federal Reserve which on Sept. 26 raised its policy interest rate for an eighth time as it tries to make sure that unemployment which has fallen to near a 50-year low does not trigger unwanted inflation. Core inflation, which excludes energy and food, was up 2% for the 12-months ending in August. It has been at that level for the past 12 months. The Fed’s goal is to keep inflation at a 2% annual gain. 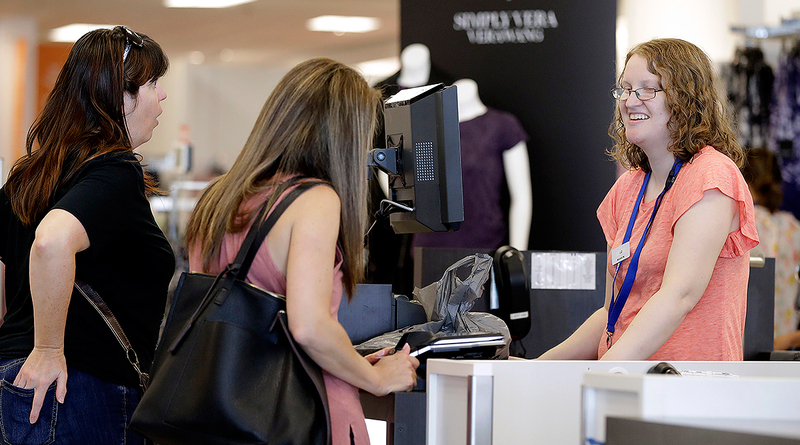 The spending report showed that purchases of durable goods, a category that includes autos, fell by 0.1% in August which held back overall spending. Purchases of nondurable goods rose a sharp 0.5%, an increase that reflected in part rising gas prices, while purchases of services rose 0.4%. Incomes, which provide the fuel for future spending, were up a modest 0.3% for a second straight month although wages and salaries, the key component of incomes, rose a strong 0.5%, the best showing since January. The saving rate in August was unchanged at 6.6% of disposable income.